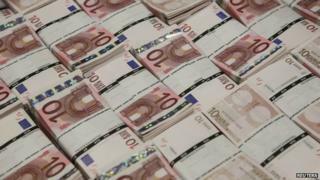 The UK has been told it must pay an extra £1.7bn (2.1bn euros) towards the European Union's budget. It has come at a politically sensitive time, with a meeting of EU leaders underway in Brussels and a UK by-election coming up in Rochester and Strood. So why is the UK suddenly being asked for extra cash? This is part of an annual process in which the European statistics agency Eurostat uses figures from member states to work out how much they should each be contributing to the EU budget. It happens every year, and in some previous years I'm told that the UK has received a rebate. You might not have noticed it in previous years, because the amounts involved have been smaller. This year, however, the UK has been asked for an additional contribution, which is considerably higher than any other member state. Why has it been asked for so much more? The UK, in common with most other countries, has been making big changes to its methodology for measuring the size of its economy this year. As a result of this, it has worked out the value of some things, such as illegal activities, which it should have been including in the national accounts for some time. It has also improved the way it keeps track of some aspects of the economy such as services provided by charities, and it has received some new or improved information. This means that when it reported the size of its economy to Eurostat for 2013, it also revised upwards the figures going back to 2002 (although the last four years were of most interest). The EU budget is divided between member states based on the size of their economies. That means that if the UK economy was bigger in previous years than had previously been reported, it means that it has been underpaying. If the UK has been paying too little it means that other EU states have been paying too much. The UK has just started including the money made from prostitution as part of the size of its economy - it's a relatively small amount of money but it's a good example. It's been added as a result of a change in statistical accounting methods, but actually it should have been doing this for years. So, the UK has now applied an estimate of this value retrospectively to previous years' figures for the value of the economy. In Germany, on the other hand, prostitution has been legal since 2002, so its value has been included in the past. What this means is that the relative sizes of the UK and German economies have been wrong, so Germany has been paying too much and the UK has been paying too little. What's going to happen to the extra money? The money will be transferred from countries that have paid too little in the past to countries that have paid too much. The EU actually seems to be losing out a little in this process - it's getting back about 420m euros (£330m) less than it's paying out. France is the biggest beneficiary, getting back about 1bn euros, while Germany will get back about 780m euros (£614m).